All is not quiet on the Western Front in 1917... high above the trenches and scarred No Man's Land the sound of piston engines can be heard, the chatter of machine guns fill the air and the bark of flak bursts echo across the countryside. During the First World War a new breed of warrior emerged, reminiscent of the Knights of old, inspired by chivalry and pushed to their limits by modern technology, they fought a new kind of war... an air war. In flying machines invented just a few years before, young, brave and daring fighter pilots took to the skies to fight for their country's cause. In airplanes made of mostly wood and canvas they climbed, dived, spiraled and sacrificed their lives. The average pilot lasted less than 20 missions and if you were hit there was no parachute to rescue you. Death could come at any time and from any direction, only the best survived. 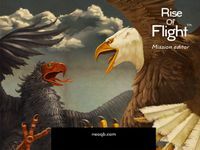 Rise of Flight puts you in the cockpit, in the sky and in the fight. The downloadable Free Demo game is actually the full package BUT with only two flyable aircraft: the Albatros D.Va and the SPAD XIII. All the aircraft types in the sim are included as AI planes. This means a player will soon want to acquire more aircraft to explore the multiplayer servers online and/or the single player career mode. There are package deals on the other aircraft, and all are available in ones or twos. Some players are devoted to 1916 types, others may only want late 1918 models. There is room for all. The majority of players seem to find the flying, dogfighting and struggle to survive is the most fun you can have sitting down.